With the apparent death of GriP/iNotifyEx projects, Notified turned into the biggest hope to get a proper notification system on iOS. 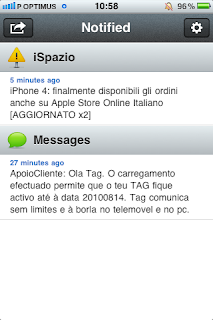 Now, after an AppStore style painfull 3 weeks period of submission process to Cydia Store, the free version has landed on Cydia! And it's pretty much what to expect from a basic level service, with the bonus of having Activator support (I assigned it to swipe down from statusbar). 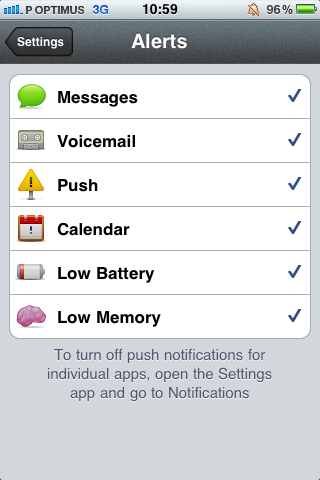 SMS, Push Notifications, Calendar, Battery, Voicemail and Memory alerts are supported. 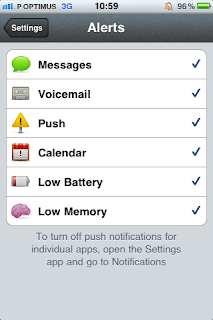 You can also choose what app to trigger by clicking on each notification. Swipe down to open, up to close, exactly like Android "drawer" notification pane. So, it's the pro version that I really want, cause it adresses most of those problems immediately, and also brings pluggin support, that according to the @notifiedapp team will permit popup blocking AND replacement, and, and this is HUGE, the team is currently working on a WebOS style pluggin (WebOS notifications are even better than Android's). That said, I hope they also add the drawer effect and quickreply I mentioned last. 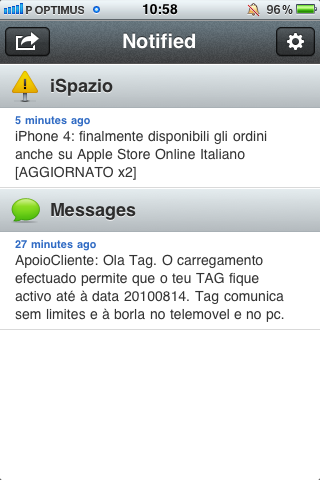 More details at notifiedapp.com and @notifiedapp. Excelente... Vamos lá ver quantos anos vamos ter que esperar até que a Apple se mexa.